Download and use our New Diet Planner to help you chart your weight loss progress. Our new Diet Planner is a Microsoft Excel Spreadsheet developed to help you easily monitor your weight loss progress, and calculate your BMI, by creating a chart of your weight loss and it works with any diet, weight loss program or even lifestyle change! 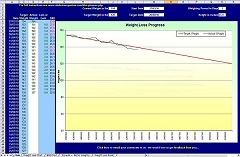 The red line on the chart shows your current weight at your start date across to your target weight at your target date. Column A shows the dates you are going to weigh yourself and column C shows what you need to weigh on each of these dates - so that you can be sure of reaching your target. Column F shows your current BMI (Body Mass Index) and in this example it starts off red because it is outside the "healthy range". As soon as you have ordered the new Diet Planner, you instantly get a link to your special download page where you can download either the Metric or Imperial versions, or both, it's up to you. You get all of the above charts and calculators with our new Diet Planner! The New Diet Planner is a Microsoft Excel Spreadsheet file and you can download it straight away. It requires Microsoft Excel 2003, Office 2003 or any more recent version. The Diet Planner is VERY easy to use but (blowing our own trumpet!) was a very complex spreadsheet for us to create so it is not compatible with other spreadsheet systems like MS Works or OpenOffice due to the advanced functionality required. The spreadsheet was created by us, IS NOT AVAILABLE ANYWHERE ELSE, and had been fully virus checked and it is SAFE. It's NEW, very easy to use and you can download it now. It doesn't matter how you are planning to lose weight - whether you are calorie counting or using any of the many different dieting methods available, our Diet Planner will help you reach your target weight by the date you want. Just click on the PayPal "Buy Now" button above and once you have completed the transaction you will be directed to a special page of our website where you can download the Diet Planner straight away. You can either work in pounds (lbs) or kilograms (kg) - the choice is yours. We recommend you weigh yourself first thing in the morning, every 7 days. If you weigh yourself more often than that you will get daily fluctuations which may not help with your overall motivation... but if you want, you can! Once you have entered the 6 bits of information above the Diet Planner is ready to use. In column A you will see the start date of your diet followed by the dates when you are going to weigh yourself. Column B shows what you need to weigh, each time, so that you reach your target weight by the end of your chosen period. A chart is automatically created - going from your start date to your target date and the red line on the graph shows your ideal gradual weight loss to reach your target. Each time you weigh yourself you simply enter your weight in column D alongside each of the dates. Then, column E automatically shows you how your weight has changed from your last weighing... if you have lost weight it shows you how many lbs (or kg) you have lost in green, if you have gained weight it shows you, in red, how much you have gained! At the same time, the chart is automatically updated with the green line on the graph showing how your weight loss is progressing compared to your gradual weight loss target - the red line. Column F automatically shows your BMI or Body Mass Index and how this changes as you lose weight. At the same time, your BMI is automatically plotted on a separate graph. Your Body Mass Index is an important indicator of your "healthiness" and whatever your weight loss goal, you should aim to stay within the "healthy" range of 18.5 to 25. The whole Diet Planner graph will automatically change to focus on that new target date - showing you the new dates for you to weigh yourself (first column), how much you need to weigh at each of these dates (second column) and the graph will automatically change to show the new range of dates along the bottom, the red line showing your target weight will adjust to your new end date and the green line will adjust to show how you are progressing towards your target weight by your new target date. The Diet Planner is re-usable again and again - simply delete all past data and start all over again. Once you have started entering your weights in column 3, you can't alter your Weighing Period (Step 5 above). This free trial version has severely limited functionality! It is the "Imperial" version so you have to enter your height in inches and your weight in pounds: the weighing period is fixed at 3 days (you can't alter this) and you can only enter your first 4 weights. It doesn't have the separate "Weight Chart" sheet, it doesn't have the separate "Weight Loss Public" chart and all the functionality is limited to your first 4 "weighings" but it gives you a good idea of how it works. We fully respect your right to Privacy. Your name and contact details - including your email address - will not be put into a mailing list and your details will never, ever be passed to anyone else under any circumstances!